Statistics show shooting numbers are down this year compared to 2016. Chicago saw a spike in shootings this Fourth of July weekend despite a decline in gun violence in recent months. 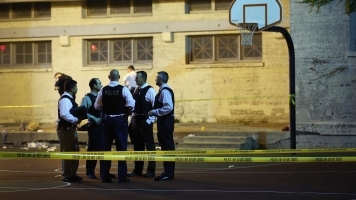 According to the Chicago Tribune, at least 101 people were shot between Friday afternoon and Wednesday morning. Fifteen of those people died. That's more than twice the number of people reportedly shot over the holiday weekend last year, though it's important to note that this Fourth of July weekend was a full day longer. According to police, 46 people were injured and four people died in multiple shootings and one stabbing over Independence Day weekend last year. The number of shooting victims over the holiday was slightly lower in 2015. But police say there's been a 14 percent drop in shootings in the first six months of 2017 compared to the first half of 2016. More than 1,800 people have been shot in Chicago so far this year. The spike in shootings comes days after U.S. Attorney General Jeff Sessions announced an increase in the number of Bureau of Alcohol, Tobacco and Firearms agents stationed in Chicago. Twenty ATF agents will help state and local officials run a gun violence task force focused on reducing the number of gun crimes in the city.